Jack: All right, your husband and wife team here coming to you from the Forever Cash Podcast. Forever Cash stands for our financial philosophy of basically always keeping one eye in your financials on generating everlasting cash flow, or in other words cash that comes in forever. That’s the name Forever Cash, also the name of the book we’ve written about that, and of the website we have on that, and the name of this podcast. Michelle: Absolutely, and this cash flow must be passive. There is nothing entirely 100% passive, but toward 90% we believe that this forever or everlasting cash flow must be somewhat passive. Jack: Absolutely, so there are multiple options for that. You can invest in dividend stocks, you can invest in businesses, and obviously then get your passive poker when you get a dividend again there, or a distribution for profits, or you can invest in what is in our opinion one of the safest ways and most profitable ways and most tax-advantaged ways, which is real estate. Jack: Right, the real residential buy and hold and flip panel was lots of hedge-fund guys and family officers, and companies that flip and move thousands of houses every year. Michelle: Yeah, it’s more like you said, institutional investors, but what was discussed and we found it definitely would serve our audience is to basically… To the audience there, they went ahead and had an entire presentation on how or when to flip and when to hold, what type of market, what type of… where in the cycle is best suited to do either one or both of those techniques. So that’s what we want to talk about today. Jack: Right, but before we get started on that, and actually what we want to do there, we want to talk about it from the angle of wealth generation. Jack: From the angle that is actually not just an abstract discussion about where to invest and so on and what markets and so on, but from a point of view of how can you use this information that we’re sharing with you today and optimize your wealth creation such that you perhaps go from a portfolio of zero houses right now to a portfolio for few houses, and then roll that over and move that smartly into millions of dollars’ worth of real estate and really your retirement income in the six figures for the rest of your life. It doesn’t have to take decades to build this. It can be built literally in a matter of three to five years if you do it in the right way so that’s what we’re going to talk about. Before… however though, as always I want to quickly mention that the podcast notes are on ForeverCash.com/Podcast as well as the actual podcast. You can download it there if you don’t subscribe to iTunes. You can also go and see the transcripts if you want to read and listen. You can have some tweetables there, and you can also leave us some feedback on there. Right on each podcast, there is a place below where you can put some notes on there. Michelle: And they can claim their free gift. Jack: Absolutely, you can also claim your free gift at ForeverCash.com/Freedom, and your free gift is waiting for you there in form of several free courses on real estate investing techniques and making money from home kind of techniques. All right, so Michelle let’s get started. Michelle: Okay, so let’s start by talking about… From the angle of wealth creation, of course. When is it a good time to flip? So what we have identified based on our experience is that it is very good to be in the business of wholesaling very quickly in market that is going down, number one; number two, in a high-price market that is stable; and number three, if you need cash. So if you need cash to reinvest into your real estate investing business and you need cash for your lifestyle to pay for your life if you don’t have a job, if you are an entrepreneur or you’re doing this full time, part of what you do, of that one-time cash that you’re producing through flips will have to do to fund your life. Jack: Absolutely, so let’s jump into that. So what would make us say… Michelle mentioned number one is flipping in a downward market. Now that’s kind of weird because in the kind of pre-show before we started, we discussed a couple of these things, and Michelle was asking me like, “Why?” or you were commenting on, “Why would you want to flip in a downward market?” because when you buy something and you have to hold it for a month, then your margin is being eroded as you flip this property the longer you hold on to it. So the key distinction here that I want to make is that in a market that is going down, currently nowhere in the United States really the market is going down, but that could change right. We had the most markets have had a good run-up again; they are very stable again. And it’s absolutely possible that a few markets, particularly those that are really, really hot right now like Denver, Atlanta and a couple of other markets that they see a downturn again. So probably as massive as has been in the past, but it’s completely possible. Jack: …To rehab the place and why every week that you hold that property you get killed in the valuation because every week the house is worth less. So you want to leave that up to somebody else to do that, and instead you want to leverage just to wholesaling, and wholesaling ideally in a way that you never even buy the property. You just lock it in a great price, you pass it onto somebody else for 5, or 10, or 15 or 20 or whatever the number is profit; and that person then goes and rehabs it and takes the chances of the market… turning the market basically running against them. In any market, there are still rehabbers out there, because every person has a different expectation of what happens in the market. When the market completely clashed in 2007, 2008, 2009, there were still people out there doing fix and flips. You just had to be very, very careful about them, but there is a lot of people out there doing wholesales, because that leads us to the other point later on. When prices got cheap enough, of course lots of buyers will show up again because cash flow would come in again. So that’s the first one in the down market. By all means, don’t do fix or flips, don’t hold on to property, and for rental properties, necessarily assuming the prices are high and is coming down from a very high number, but mainly focus on quick wholesale deals. Michelle: It was the high-priced markets that are stable basically. Jack: High-priced markets that are stable. I’ll let you cover that. But my two cents about that is that the bottom line is in a high-priced market, if you want to buy and hold, you’re not going to get any cash flow on these properties. That is as simple as it is. So look at Los Angeles, look at San Francisco, like if you have to pay $800,000 to buy a condo that rents for… even if it rents for $5,000, it’s barely any cash flow because even of you put $100 grand and if you think about it, you might put $200,000 down on that thing or $150,000 down at 20%, and then you have $650,000 mortgage. That with all the expenses around it costs you $4,000, $5,000 and chances are a condo like that which is in a San Francisco area, a regular condo, you only are probably going to get $4,000 in rent. So you’re lucky if you break even on those things. So it is a pure appreciation game, but if the prices are already at almost a million dollars for something simple, then how much more can it reasonably appreciate? Jack: Right, the key here is find them on a discount and you flip it on to somebody else and so on. Michelle: Whose exit might be completely different than yours. Jack: Exactly. It might be a buy and hold. Now fix and flip in such market is totally possible. So we’re talking about flipping versus holding. So within the flipping, you can do wholesaling or you can fix and flip. Now in a declining marketing, you don’t want to do fix and flip; you just want to wholesale. In a stable high-priced market, you can totally make a lot of money fixing and flipping, because you get that $800,000 house for $550,000 and you put in $100,000 in there; you sell it for $800,000; you just made $150,000 profit on that property. So it can be extremely profitable to do that, but holding really if you’re a cash flow person like we are, it doesn’t make sense. Jack: So now I actually covered it myself. Michelle: You covered it yourself. Then the third one was if you need cash, and I think that’s kind of like self-explanatory. If you need it for whatever emergencies or you’re going to reinvest, then you just go ahead and wholesale. So then let’s talk about when to buy and hold. So I think number one, the time when you want to buy and hold is when you’re getting deals that cash flow and you’re in an appreciating market. Jack: When we started buying houses. Jack: Right, exactly. And that point was… So let’s look at that. So let’s go back since we have two of them covered. Let’s go back to the first one before we go too much into this one right now. So the first one is obviously when prices are going up. So if you have identified a market that is about to take off or a market that has nice appreciation, then absolutely you should buy and hold assuming that you still get some cash flow, because here is the thing, the biggest problem that happened in 2004 to 2007 in those big crazy markets is that people were bitten by the bug of appreciation without consideration for cash flow. So they’d taken on these REOs, they had taken on these reverse mortgages, they’d taken on these mortgages with like 0% interest… 0.99% interest for the first year, and then it jumps up to a higher percent interest, and they’d taken all those things in just to be able to get that deal because the expectation was the property is worth $50 or $100,000 more next year. And they had many cases, even with those numbers, they had negative cash flow but they didn’t care, because if they get negative cash flow of $500 a month for the first year, and then after that first year they could… They basically spend $6,000 but they could sell that property for $100,000 more. They took that risk. Jack: Exactly, the thing is once the music stopped playing, there wasn’t enough chairs for everyone to sit on. The musical choir turned, and a whole bunch of people got left standing in the rain with finding nowhere. There’s no next fool to continue that kind of game. So you don’t want to play that game ever at all. You want to be playing it safe, so basically you want to buy in a market where you get cash flow on your properties with a reasonable down payment, and then so that you have a good return on your investment. So at the very minimum, you should be having a 15 or so percent cash-on-cash return. But at the same time, or if the market stops going up or continues going down, you can still afford holding up to that house and still have cash flow from it. So therefore you’re protected against what happened in 2008 where people lost everything, because you won’t ever have to fire sale and get rid of these properties at a discount, because even though you might be upside down you’re still getting a check every month from your tenants that cover more than the mortgage. Jack: So that’s an important piece also. But if in that scenario you see a market that is appreciating, by all means go buy as many houses as you can; get the cash flow from them. But now you’re getting the additional benefit of the appreciation, and the appreciation in that case is a bonus. Michelle: Is a bonus. For us, it has never been the main reason to invest or to go into a market. It has always been the secondary bonus or gravy. Strictly, if the cash flows, it’s great; if it doesn’t, it’s not great. It basically needs to put money into your pocket. Jack: Right. And that leads us to the number two, and it says when the cash flows are strong. So one and two really belong together, because when do you want to go into any market is when you can get cash flow for these properties. So in 2009, even though we are at that point when we were pure land investors, we were land flippers, we had not really bought a house other than our own first rental house that we… our starter home. Michelle: That is now a rental, yeah. Jack: And then the appreciation that happened was a bonus. Michelle: Absolutely, and it was at a point where basically the house was so cheap that per square footage to try to build it basically was cheaper right now than trying to build it again. Jack: It was below replacement costs. And the other part too that we honestly did not care was what the market value would do in that market. We didn’t care if the prices would go further down. We were like, “Great, let’s keep buying at even cheaper rates. And if market prices will go up, well at some point of time, we would stop buying,” and that’s actually exactly what happened. What happened is that moment when markets started rallying up, and at some point of time the same houses we bought for $30, $40, $50,000 now cost $80, $90 or $100,000 and the cash flow would go out the window again. All of a sudden, if we would buy these properties for cash first of all, you would have to put a lot of cash to buy them. And then we would get only $800 rent which translated into let’s say $500 a month net. So we would get a 5% return on our money. That’s below our money rules. And if we finance it, we would still only have like $500 dollars net cash flow to pay the mortgage, and the mortgage on a $100,000 house is more than $500 even at low interest rates. So as a result, we basically stopped buying. But now, if you now look at these five pieces together, what we didn’t say is that we started flipping houses in the market, because now prices were too high for us to make sense, but prices were stable and now we basically flipped and wholesaled houses and we do this to this day to other fix and flippers. Michelle: Using our ‘Flip It Fast’ formula. Michelle: You really need to know what you’re doing and you need to have somebody local there on the ground. Jack: Yeah, you need to know exactly what you’re doing. But many other communities in the Midwest have prices where you can buy houses in the $40, $50, $60,000 range that rent for $800 to $2,000. So you need to basically though… And are they going to get appreciation? I don’t know; I can’t see the future. Michelle: And we really don’t care. It would be nice to have, but yeah. Jack: And when we bought in 2009, 2010, 2011. We expected the appreciation to take another 10 years. To our eyes, we basically thought… We never imagined the market would recover as fast as it did. Michelle: Yeah, we had a very bare outlook. Jack: Yeah, we had a bare outlook. We could have… We thought that around 2018, 2019, the market would finally recover, and we were pleasantly surprised. Jack: Brick-built homes of between four- and five-bedroom houses that would accommodate multiple families. And actually that’s exactly what happened. We got multiple families moving in together for a time period, but then after a couple of years they moved out again. And now we have single families living there, but still these are great houses to own. So going back to thing, the piece now for you obviously is the past is the past. You can’t go back to 2009 and buy houses at recession prices. That’s why I’m saying, though there are still markets, there are market areas in Florida where they can buy at prices like that. There are areas in the Carolinas, there are areas in many areas of the United States that are not L.A., San Francisco, New York and probably Atlanta, Denver and Phoenix but there are many areas in the country where you can still buy properties like that. And if you understand that appreciation is only a bonus, you can go in there today and who knows? Some of them might actually take off in the future and they need to come up to some point to at least replacement cost. Michelle: Yeah, if you’ve invested right now in the market you know already and you’re seeing a nice cash flow but cash flow compared to equity is not so good, then you can always sell some of this property in the higher-priced market and go up after markets such as the ones in like Jack was mentioning in the Midwest, and basically get more houses for the same money and similar rents. 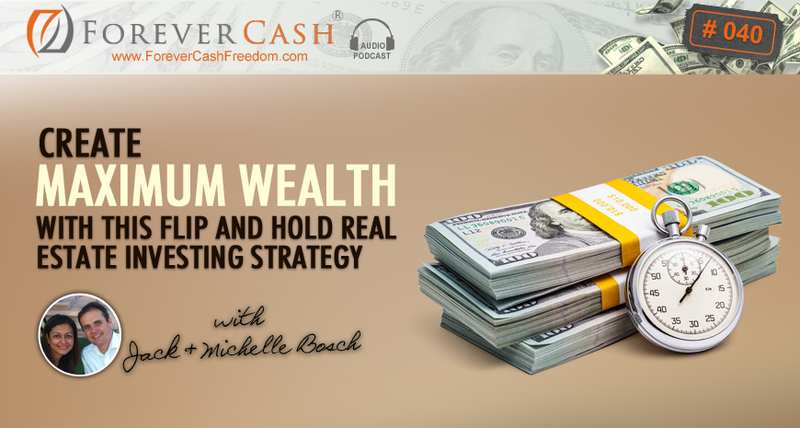 Jack: And that’s exactly to summarize this and bring this podcast to a conclusion, that’s exactly the strategy that you want to use for ultimate wealth creation. So you find a market, so it’s a few steps only, so we’re going to walk you through there right now. Step number one is you find markets that you can buy right now and get tremendous cash flow from these properties, and I said there are many markets out there. Number two, what you do is ideally you find markets that are in appreciation mode. There are certain markets in Florida that are like that, there are certain markets in other states that are like that, and you flip a few properties and flipping generates the cash that you need to then buy some of these rental houses, and then you keep those. And as the market appreciates, what do you do? At some point of time, you’re going to hit the point where the houses in that market are now too expensive to make sense for you to buy as rental homes anymore. Michelle: I think we shared it in a prior podcast. Jack: It’s really low prices. But let’s say our average cost that we bought for $40, $50 is now worth $150, we got an extra $100,000 for a house sitting there around in equity. So we’re taking that equity out, leveraging these houses again and now moving that equity over into other markets where we can still buy houses again the $30, $40, $50, $60,000 range. Therefore, let’s say when you refinance or sell one house, you can go buy three houses in the other market. And if that house rents for $900 and the house there rent for $900, guess what? You turn $900 into $2,700 in cash flow and now you tripled plus you expanded your asset base. You now have three houses that now can appreciate in the other market. And tripling your appreciation effect, that is the bonus. But most importantly you now have taken… Let’s say you do that with three houses, you have $2,700 coming in. You leverage them and with just the equity, the equity that you take out, you buy six more houses in the other market. Now you get nine houses each spinning out net $500 a month and you got $4,500 a month coming in cash flow. And then you can just keep doing that again and again and again every three to five years. As markets go up, you take the equity out; you move into another market; and in matter of a few years, you have built a very, very cool passive income. Jack: All right, so anything you want to add to that? Michelle: I think that was… You said it in a nutshell. Jack: All right. Well, that’s the strategy and you can totally boost these strategies obviously with ways that we line out, with additional ways to make money. The more money you can make, the more investments you can make. And therefore obviously using methods like the ‘Flip It Fast’ formula, using methods like the land flipping, using methods… any kind of flipping has its place because it helps you create that cash, the seed money as we call it, to then invest into your passive properties that are managed by property managers. Jack: And we would love if you go to iTunes and search for the Forever Cash Real Estate Podcast. Give us ideally a five-star rating, and also post little comments on there and what you enjoy most about the podcast. So with that, thank you very much. And we’ll talk to you or see you or you’ll hear from us in a week. Bye-bye.